A group known for its live performances lived up to that reputation. My Morning Jacket. Photo by Melissa Miller. 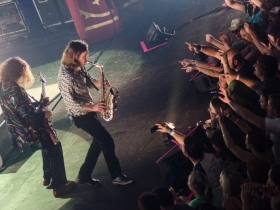 It was no surprise that My Morning Jacket needed to add another show to accommodate their devoted fan base. The Kentucky-based band gave back-to-back performances this past weekend at the Riverside Theatre and from the crowd’s reaction it’s safe to say they didn’t disappoint. Floating Action kicked off the concert with a set that followed the multi-genre nature of My Morning Jacket. 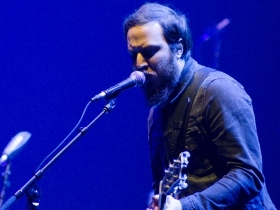 Lead singer and guitarist Seth Kauffman dominated Floating Action’s performance. Kauffman’s musicianship was notable and his band brought the crowd to life especially with a spot-on drum solo. 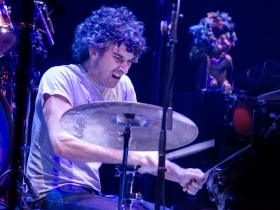 During drummer Josh Carpenter’s solo you could feel the electricity run through the audience. 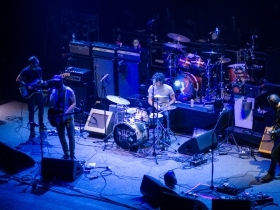 Floating Action was a great choice to open for My Morning Jacket. 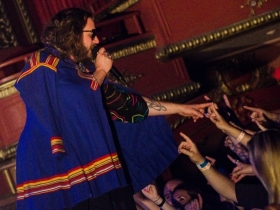 My Morning Jacket hit the stage with cheers from a fully-charged fan base. They began their second show of the weekend with “Spring (Among the Living)” from their newly released album The Waterfall. 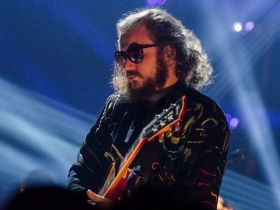 The eerie romantic quality of Jim James’s voice is a key part of the appeal of a band whose eclectic sound has won it various labels, including alt-country, Southern rock, indie and others. 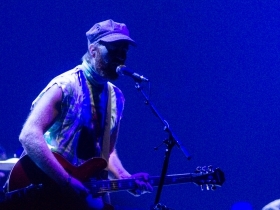 The band is famous for its live performances, which some critics have suggested are better than the studio albums, and MMJ didn’t disappoint at the Riverside. While the music easily could’ve stood alone, it was the sheer showmanship of the performers that allows me to say it was one of the best shows I’ve ever seen. 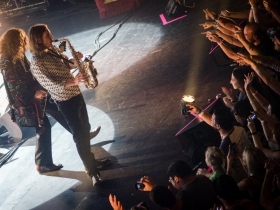 Their love of the music and strong stage presence were heightened by deft, dramatic lighting, all of which kept the audience engaged and elated throughout the show. 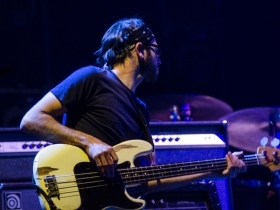 The band ended the show with “Phone Went West” from their 2001 album At Dawn. The crowd erupted with pleas for an encore. 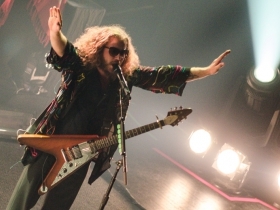 My Morning Jacket responded with a five-song sampler from their early 2000s material. 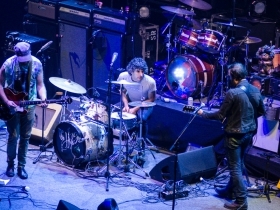 One of the challenges for any band with a vast repertoire is creating a cohesive set list. No problem for MMJ: the set list flowed naturally and added to show’s excitement. 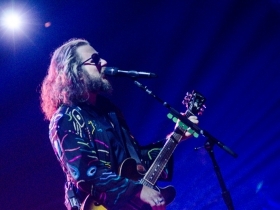 My Morning Jacket will continue their tour in Columbus, Ohio with another double-header at the Palace Theatre starting on June 23.